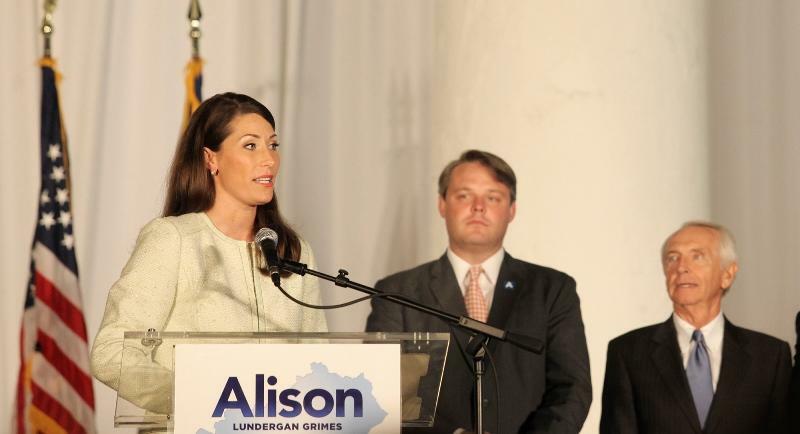 Alison Lundergan Grimes is speaking at the 2016 Democratic National Convention. The fourth and final night of the Republican National Convention is all about the GOP's presidential nominee: Donald J. Trump. Trump has been a presence every night of the convention. He introduced his wife, Melania, on Monday; briefly addressed delegates via video Tuesday; and helicoptered into Cleveland Wednesday to appear on stage with vice presidential nominee Mike Pence – and, of course, stare down rogue Republican Ted Cruz. But tonight is Trump's big moment – indeed, one of the biggest moments of his presidential campaign. The big question: which Trump will show up? The on-message candidate who reads off the TelePrompTer? Or the Trump who ad-libs, riffs off the crowd, and strays from the campaign's message of choice? For all those who view the nominating conventions of the major parties as overly scripted, predictable and boring, Wednesday night's session of the Republican National Convention came as a jolt. The third night of this extravaganza had all the usual hoopla — plus a blackout on the jumbo screens, delegates screaming at each other, and a major presidential candidate getting booed off the stage. Not since the parties and their nominees began carefully scripting these quadrennial affairs a generation ago have we seen such an outburst of dueling egos and counterproductive emotion. Did we say we wanted more sense of drama? Imagine two famous actors involved in a climactic scene, each fired with his own ambition and working furiously to upstage the other. Now envision such a clash playing out before thousands of delegates and onlookers and millions of TV viewers and voters. Donald Trump and Ted Cruz, the first- and second-place finishers in the GOP's primaries and caucuses, went at it once more with the whole world watching. The high stakes of their brinkmanship brought to the flashpoint all the anger and tension pent up in this convention over three days — and in this party over several decades. During his speech Wednesday night at the Republican National Convention, State Sen. Ralph Alvarado urged Hispanics to vote for Donald Trump. Alvarado, a Republican from Winchester and a physician, is the first Hispanic elected to the Kentucky General Assembly and has garnered a reputation for his opposition to the Affordable Care Act. He delivered part of his speech in Spanish, saying that Hispanics escaped countries full of corruption and political dishonesty. It's no secret Donald Trump is struggling to woo Hispanics voters. He's currently polling worse with Latinos than Mitt Romney in 2012 (In that election, Romney captured just 27 percent of the Hispanic vote). The other man, Ralph Alvarado, is a little known state-senator from Kentucky. Alvarado, 46, is also a doctor and a delegate for his home state. And in 2014, he became the the first Hispanic elected to state office in Kentucky. In an interview at the Quicken Loans Arena between floor speeches, Alvarado took some time to chat about Trump, Hispanics, and the Republican party.